Tue., June 26, 2018, 5:55 a.m.
Spokane 6, Vancouver 0: Ryan Dease (2-0, 1.50) allowed four hits and no walks while striking out five in seven innings to help the Indians (4-7) shut out the visiting Canadians (3-8). Boise 7, Eugene 2: Pearson McMahan (1-0) gave up two runs on two hits over five innings and the visiting Hawks (6-5) topped the Emeralds (5-6). Cade Harris and Luis Castro had two hits apiece and drove in a run. 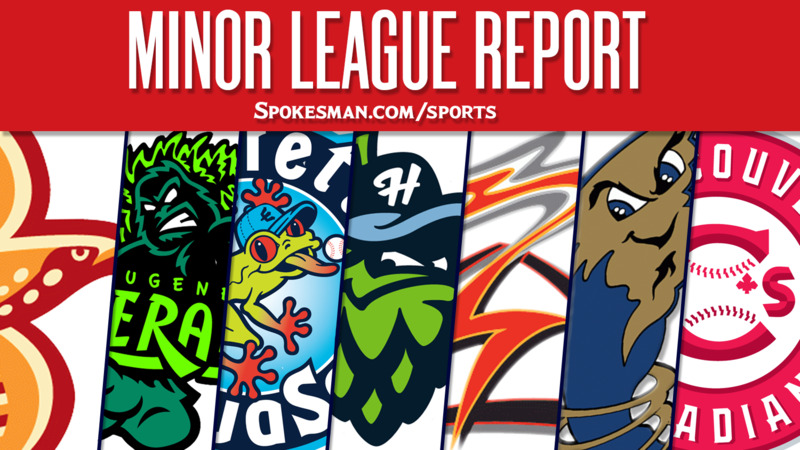 Tri-City 6, Everett 5 (11): Tre Carter singled to score Luke Becker in the 11th inning and the visiting Dust Devils (6-5) held off the AquaSox (7-4) in extra innings. Dwanya Williams-Sutton hit a two-run homer for Tri-City. Hillsboro 12, Salem-Keizer 2: Tra Holmes and Andy Yerzy homered and the Hops (6-5) edged the visiting Volcanoes (7-4). Holmes and Yerzy had three hits apiece for Hillsboro. Round Rock 7, Omaha 1: Chris Jensen (1-0) gave up an unearned run on one hit and two walks over five innings and the Express (34-42) beat the visiting Storm Chasers (35-40). Drew Robinson went 3 for 5 with two RBIs. Hunter Cole hit a two-run homer and Andy Ibanez added a solo shot. Frisco: The RoughRiders were off on Monday. Down East 5, Potomac 1: Yohander Mendez allowed one run on three hits and a walk with nine strikeouts and the Wood Ducks beat the visiting Nationals. Josh Altmann hit a three-run homer for Down East. Hickory 4, August 3 (11): Bubba Thompson singled home a free baserunner and the Crawdads (32-41) outlasted the GreenJackets (39-34) in extra innings. Thompson went 3 for 6 while Sam Huff hit a solo home run, his ninth of the season. Published: June 26, 2018, 5:55 a.m.